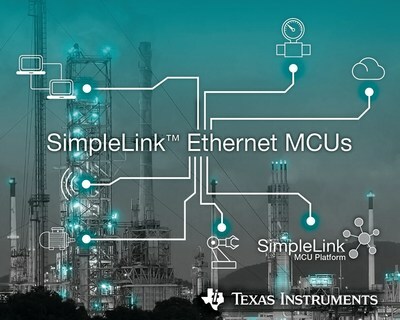 DALLAS, Nov. 28, 2017 /PRNewswire/ -- Making it easier for developers to connect sensors from a gateway to the cloud, Texas Instruments (TI) (NASDAQ: TXN) today introduced Ethernet connectivity to the SimpleLink™ microcontroller (MCU) platform, a single hardware, software and tool platform for wired and wireless MCUs. The new SimpleLink MSP432™ Ethernet MCUs are based on a high-performance 120-MHz Arm® Cortex®-M4F core with an integrated MAC and PHY, helping accelerate time to market for grid infrastructure and industrial automation gateway applications. For more information, see www.ti.com/simplelinkethernet-pr. Developers can get started immediately with SimpleLink Ethernet MCU-based development kits available through the TI store and authorized distributors. The MSP432E401Y MCU LaunchPad™ development kit (MSP-EXP432E401Y) is available for US$19.99. Additionally, the MSP432E4 MCUs are available for mass production, priced at US$9.00 in 1,000-unit quantities. Learn more about the SimpleLink MCU platform. Watch this video to learn "Why you need an industrial gateway." Download TI’s new white paper, "Building a gateway from sensors to the cloud." Subscribe to the ConnecTIng Wirelessly blog. The SimpleLink MCU platform from Texas Instruments is a single development environment that delivers flexible hardware, software and tool options for customers developing Internet of Things (IoT) applications. With a single software architecture, modular development kits and free software tools for every point in the design life cycle, the SimpleLink MCU ecosystem allows 100 percent code reuse across the portfolio of microcontrollers, which supports a wide range of connectivity standards and technologies including RS-485, Bluetooth low energy, Wi-Fi®, Sub-1 GHz, 6LoWPAN, Ethernet, RF4CE and proprietary radio frequencies. SimpleLink MCUs help manufacturers easily develop and seamlessly reuse resources to expand their portfolio of connected products. www.ti.com/simplelink. LaunchPad, MSP432 and SimpleLink are trademarks of Texas Instruments. All registered trademarks and other trademarks belong to their respective owners.